Review	Overall rating:	4.8	out of 5 based on 54	reviews. 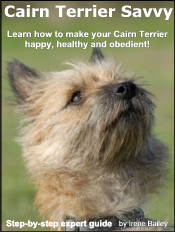 My Cairn Terrier Can Sit, Stay & Come! - Sallie Ortiz,	Kennewick	WA	U.S.A.
- Alana D. Barrett,	Irving	Texas	U.S.A.
- Patricia Sargent,	Deer Park	New York	U.S.A.
- Sherrye LaCour,	Madison	Mississippi	U.S.A.
very dependent and anxious dog?